Unfortunately, it seems his website is dead and there isn't a replacement. I got a tiny bit of inside info which says this is the book every Cohen fan should read. When Leonard Cohen passed away in late 2016, he left behind many who cared for and admired him, but perhaps few knew him better than longtime friend Eric Lerner. 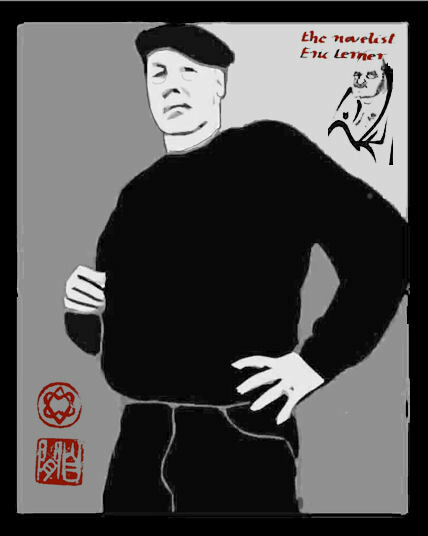 Lerner, a screenwriter and novelist, first met Cohen at a zen retreat where the two quickly bonded. The pair lost touch for a time but, ten years later, they picked up right where they left off and became practically inseparable. A powerful commitment to zen practices flowed through their friendship and allowed it to become ever deeper over time. Over the years the two shared a house and helped each other through the pains of divorce, the joys of raising children, and the ups and downs of the writing life. These two friends helped guide one another through life's myriad obstacles, and now that journey will be told from a new perspective for the first time. 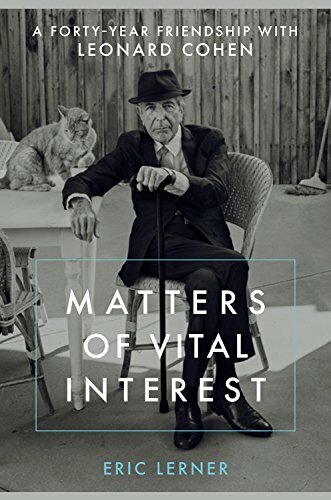 Well-written, funny, revealing, self-aware, and grounded, Matters of Vital Interest is a charming memoir about Lerner's relationship with his lifelong friend. His views of Cohen are unique, warm, and often funny, and in recounting these tales he reveals a touching portrait of what a deep bond between two men can truly be. Offering further insight into Cohen's idiosyncratic style, his dignified life, the way he was deeply informed by his spiritual practices, and his sensibility as a poet first, musician second, Lerner allows readers to understand a new facet of this fascinating man through the eyes of his closest friend, and in so doing continue his legacy as a captivating persona the likes of which we may never see again. The book was already on my list of what to look out for in 2018. Thank you for reinforcing that. Thanks Marie. I preordered the kindle verson a few weeks ago and am looking forward to reading it. Over a long career Eric Lerner has written a memoir of his early adventures in Buddhism, edited the off-the-wall journal Zero, was credited as writer and producer on the movies Bird on a Wire, Augustus, and Kiss the Sky, and written several novels, including Pinkerton’s Secret: The Original Manuscript. Regretfully, I finished this memoir by Eric Lerner today. The depth, honesty, caring and sheer pricelessness of the friendship between Eric and Leonard - until the very last minutes of Leonard's life - is so very beautifully revealed by Mr Lerner. I don't usually care for lots of biographical information about artists, because the art is the thing; the art is the polished distillation of experience. But this book is pretty much an epic poem that Eric and Leonard worked on together with their every sinew, and Eric committed to print. For an insight into the realest 'real' Leonard Cohen, sorry to use a cliche but I really cannot recommend it enough! I just received this book (I bought it based on the glowing recommendations here), but I haven't yet read it. I am looking forward to it! Wow, Anny and Geoffrey, those were quick responses! I hope The Big Bang... book does not disappoint -- I found it to be very illuminating, and quite enjoyable to read. All the best! That author is a different Eric Lerner altogether. He's not the one who wrote the Cohen book. LisaLCFan wrote: ... Eric Lerner also wrote a most fascinating book called The Big Bang Never Happened…. Oh, well, thank you, I stand corrected! (It's still a good book, whoever the real Eric Lerner is!). I just finished this and also loved it. It brings a different level of intimacy I don't think has been uncovered in any books regarding LC. Seeing him as just a normal guy trying to get through life the best he could, it is not showing LC the showman or poet, but a man hanging out with one of his best friends. The sections regarding the last couple years of his life were quite intense and a little hard to read. I can see myself reading this again. A very well done effort on Mr. Lerner's part.